Trades volatility breakouts on the 15min timeframe. Designed on EURUSD. Uses dynamic self adjusting Targets and Stops. Cuts losses short letting profits run. No Grid or Martingale components. Designed, tested, and optimized using the highest quality data (Birt’s TDS). Trades on average a few times a week. Robust! Not only surviving but THRIVING over 10 years and all market conditions(including the great financial crisis of 2008). The strategy is based around the fact that breakouts (whether caused by news reports, trendline breaks, etc..) create trends. Ascent II captures these emerging trends adding to positions when conditions present themselves for maximum profitability. Static Lot Size: If not using Advanced Money Management, this lot size will be used. Advanced Money Management: Set true to enable percent based lot sizing. 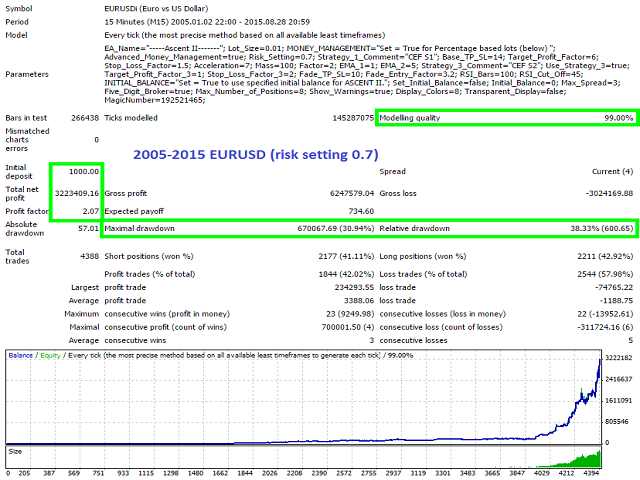 Risk Setting: Risk setting to be used with percent based lots. Tag 1: Strategy 1 trade tag identifier. TP/SL ATR Bars: ATR bars to be used in calculating Targets and Stops. TP Factor: Factor of ATR for Targets. SL Factor: Factor of ATR for Stops. Qualifier: Volatility Cut Off Logic. Generally a range of 2.0 - 3.0 is best. MA 1: Number of bars for MA 1. MA 2: Number of bars for MA 2. Tag 2: Strategy 2 trade tag identifier. Enable Strategy 2: Set true to enable strategy 2. TP Factor 2: Factor of ATR for Targets. SL Factor 2: Factor of ATR for Stops. S2 ATR Bars: ATR bars to be used in calculating Targets and Stops. S2 Qualifier: Fading Volatility Cut Off Logic. RSI Bars: Number of RSI Bars. RSI Cut Off: RSI Cut Off amount. Use Initial Balance: Set true to give Ascent II a specified balance. Initial Balance Amount: Amount to be used as initial balance. 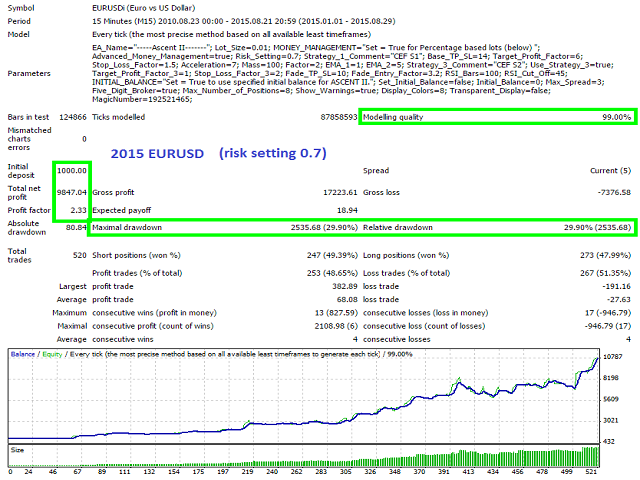 Max Spread: Maximum allowable spread when entering trades. 5 Digit Broker: Set true for 5 digit brokers. 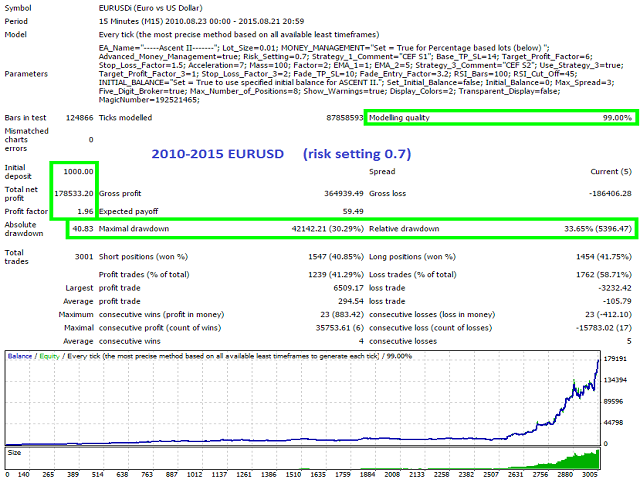 Max Positions: Maximum number of open positions allowed at one time. Show Warnings: Set true to show warnings. Display Color: Select a number 1-10 for display color options. Transparent Display: Set true to see chart through display. Magic Number: Identifying serial number. Use a unique number for each instance of your EAs. Default settings are intended for operation on the EURUSD 15min chart. 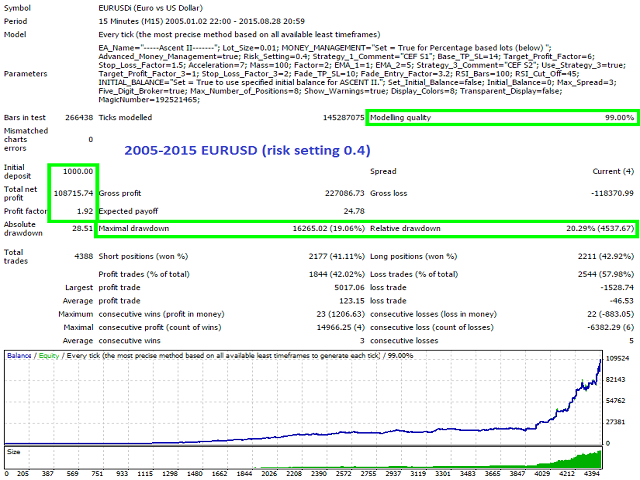 ALL VARIABLES are left exposed however, enabling you the trader to optimize and trade Ascent II on many instruments. Как всегда ЕА на высоте ! Great long-term robot. The idea behind it is fantastic. на демо хорошо работал, но на реале результаты отличаются. Проводил тестирование на DEMO-счете с балансом 1000$. За 1 месяц тестирования увеличение баланса составило 8,7%. Проводил тестирование на DEMO-счете с балансом 100$. За 1 месяц тестирования увеличение баланса составило 20,59%. Real traded not proved yet.